There was nothing penny-ante about the one cent piece in the mid-19th century: Its buying power was substantial. The famed King Ranch in Texas, for example, came into being in 1853 when steamboat captain Richard King bought 15,500 acres for just $300, less than two cents per acre. For working-class Americans, 10 cents an hour was a living wage, so people understandably watched their "pennies" closely. 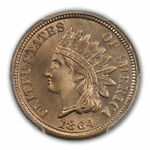 By the 1850s, many Americans actually were clamoring to have the cent's clout diminished. What bothered them, however, wasn't its buying power but its size: The copper cent then being minted was almost as large and heavy as today's half dollar, and many had come to consider it simply too big for their britches. The United States Mint responded to this concern in 1857 when it discontinued the large cent and half cent and introduced the nation's first small-size cent, the Flying Eagle design. But it soon became obvious that the new cent, featuring a portrait of an eagle in flight, was a less-than-perfect solution: Because of deficiencies in its design, it often emerged weakly struck, especially at the eagle's tail and wingtip. Ambivalent though he might have been, the chief engraver threw himself into the task with remarkable zeal, creating more than a dozen pattern cents. Many of these were refinements of the Flying Eagle coin, with modifications meant to make it easier to strike. On some, for example, the eagle's tail and wingtip were shortened and moved away from the obverse's rim; that way, they didn't appear directly opposite the wreath on the reverse, the clash that had caused the weak-strike problem in the first place. At one point, Director Snowden suggested that Longacre fashion a head of Christopher Columbus for the cent. The chief engraver replied that while the idea was "entitled to consideration," it seemed likely to stir opposition, for "how can it be relieved of any of the objections that have theretofore prevailed against the introduction of the head of [George] Washington upon the coinage of the United States?" In the end, Longacre came up with an alternative that Snowden liked even better: a portrait of an Indian girl or more likely a Caucasian wearing a feathered headdress. The Mint director chose this design to replace the flying eagle with the start of production in January 1859, paired with a simple laurel wreath on the reverse not only for aesthetic reasons, it would seem, but also because the combination had the lowest relief of all the ones proposed. Simplicity is the hallmark of the coin: Aside from the Indian portrait, the obverse bears only the date and the inscription UNITED STATES OF AMERICA, while there's nothing on the reverse except the wreath and the words ONE CENT within it. An oft-repeated story has it that Longacre modeled the "Indian" after his young daughter, Sarah. Evidence suggests that this is pure fantasy: Researchers have found drawings of virtually the same female head in Longacre sketchbooks from 10 years earlier, always with the same adult proportions and the same long "Greek" nose. And the artist himself referred to this profile in letters and official memoranda as being that of the Venus Accroupie, or "Crouching Venus"a Greco-Roman statue displayed at that time in a Philadelphia museum. Whatever the source of his inspiration, it's clear that his idea was indeed inspired, for the Indian Head cent won immediate and enduring acclaim from the American public. In his book Numismatic Art in America, Cornelius Vermeule hails it as "perhaps the most beloved and typically American of any piece great or small in the American series." "Great art the coin was not," Vermeule declares, "but it was one of the first products of the United States Mint to achieve the common touch and to identify itself with the transitions from frontier to industrial to social expansion during its decades of circulation ..."
The Mint could not have chosen a more momentous time to introduce the coin: It entered the nation's commerce on the eve of the Civil War. Perhaps in anticipation of the coming crisis, in 1860 Mint Director Snowden sought and obtained permission to add a national symbol, a small federal shield, at the top of the coin's reverse. That same year, the laurel wreath gave way to a thicker oak wreath. 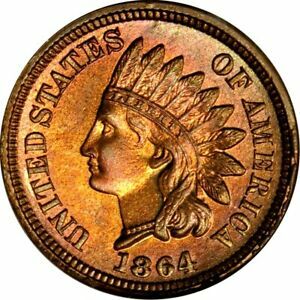 Copper-nickel Indian Head cents were minted annually from 1859 through 1864, with a total of about 158 million being made all in Philadelphia. Proofs were struck each year as well. The series contains no great rarities, and the only major variety is an 1860 cent on which the Indian's bust is pointed, rather than rounded. 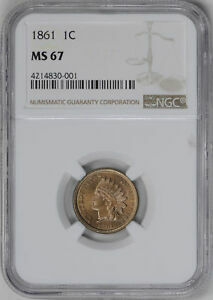 Mint-state examples are relatively abundant in grades up to MS-65. When grading this design, the first places to show wear on the obverse will be the hair above the ear and the curl to the right of the ribbon; on the reverse, check the bow knot. Because the series is so short and has no real "stoppers," many collect it by date. Many others prefer to collect it by type, acquiring one example of the 1859 and one to represent the years from 1860 through 1864, when the reverse was different. 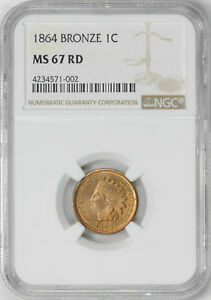 Like its Flying Eagle predecessor, the Indian Head cent started out as a copper-nickel coin, made from an alloy whose light color led to its being called a "white" cent. War-related hoarding caused the Mint to switch to a cheaper bronze alloy in 1864 and also to reduce the weight by a third, resulting in a thinner coin much like the cent we know today. But the Indian Head portrait remained in use for half a century before giving way to the Lincoln cent in 1909. Yeoman, R.S., A Guide Book of United States Coins, 48th Edition, Western Publishing Co., Racine, WI, 1994.